I made a knitting resolution last year– to use up odd balls of yarn that had been hanging around the house for far too long – and I passed my target of knitting up half of the dozen little bags of yarn I photographed. There was no resolution this year, because at the start of the year I was re-working the Man of the House’s Aran. I’d not taken account of the depth of the armholes and the sleeves were much too long. I was ready to knit something else but after putting so much work in I had to put in a little more and have it exactly right. Things I haven’t done before. Continuing to use yarn that’s already in the house. Not so much a resolution as a new design for a knitting life. I had a break from knitting when the Aran was finally finished – but I’ve picked up my needles again – and I have a sweater nearly finished and a hat to show you today. I had a single skein of Merlin Aran for Eden Cottage Yarns. The yarn is lovely. It has exactly the right balance of substance and strength, it’s developed a lovely halo now it’s knitted up,. The shade – India – is perfectly poised between red and pink, and it has just enough variation to give it depth without becoming variegated. I’d had my eye on Queenie by Woolly Wormhead for quite some time. It’s a child’s pattern, but I loved the shape, and if you look through the projects on Ravelry you’ll see that several people have scaled it up to make an adult hat. I was sure that I could do the same. And I did! It fits perfectly – me and the dog! I love it – but there’s one big problem. It doesn’t suit me at all. I should have known – I’ve learned over the years that it’s not enough to simply love the yarn and the pattern – I know that I have to cherry-pick the things I love to find the ones that I will love to knit, that will suit me, and that I will have occasion to wear. I was distracted by a lovely yarn and a striking pattern. The sweater that I mentioned. This one – but in quite different colours. Then I have another one in mind. And another hat …. The Bears are doing green-eyed jealously in a big way. I have tried to persuade them that the colour really won’t go with their very post office red bows but you know what they’re like when they get an idea in their heads. I have stood next to our post box and given it a good sniffing many times, and I have to say that Alex is right this time. Red bows in that shade sound very stylish but they wouldn’t go well with this particular hat. 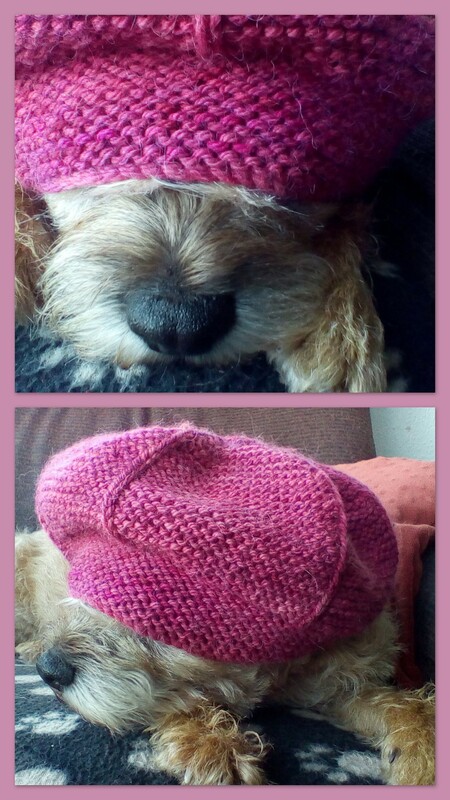 It’s a *beautiful* hat Jane (and Briar looks very fetching in it! what a patient dog!) Sometimes things don’t look on us how we would wish but I’m sure someone will love it! It is lovely, Jane! And I love the pictures of Briar wearing it. Is it the color or the style that doesn’t work for you? Well it’s been said already but it can’t hurt to say it again: Briar looks adorable in that lovely hat! I’m glad to see you knitting again and look forward to your future projects. That first photo of Briar with just her nose peeking out: heart melter. As a fellow few-hats-suit-me sufferer, I hear you re loving the yarn and the pattern, only to discover that one looks like a teapot on the lam with its cosy. *sigh* It’s a beautiful hat and someone will be glad of it. I made a resolution to knit a garment, so I bought a lacy waistcoat kit with gorgeous denim blue cotton yarn, which feels silky. But it is in hanks, and there is a circular needle (even though it’s not a circular garment), and there are hundreds of stitches, and it’s quite long, and knitted in one piece, and looks awfully complicated, and I’m too petrified to make a start – I just keep getting it out of the packet and stroking the yarn because it’s such a wonderful colour and looks so nice! I need to start a similar use-up-the-random-balls-of-yarn mission! I have a lot of random stuff left over from other projects, but I think I’ll need to make some specific plans if I really want to get it accomplished. Thanks for the inspiration. I know how frustrating it can be to have to spend additional time on a long project. Good on you for sticking to the Aran instead of setting aside!